The new school year is just one week away and we're working hard to get our schools ready to welcome students! All district teachers and staff return to work on Monday to prepare for the start of another great year. We're looking forward to greeeting students and families during back to school events this week. Check your school's website or the districtwide calendar for event details. Two siblings from Stillwater had an out-of-this-world summer vacation. 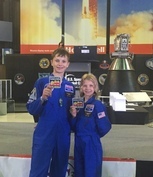 Austin (AJ) and Lorelei Fierro traveled to the U.S. Space and Rocket Center in Huntsville, Alabama and spent a week at Space Camp in the NASA Marshall Space Flight Center’s Official Visitor Center. Read more. Be sure to check your mailboxes this week for specific bus route information for your child. New This Year: Families can download a mobile app to track their bus. The Versatrans MyStop app compares GPS data to routing data to give families information as to where their school bus is located and what time it is expected at their stop. More information about the app can be found on our website. Properties identified as Parcel ID 33.029.20.34.0002, Parcel ID 04.028.20.21.0005 and Parcel ID 33.029.20.33.0001. Pursuant to Minnesota Statute §13D.05 Subd. 3. (3) to develop or consider offers or counteroffers for the purchase or sale of real or personal property. The school board is canceling their learning session scheduled for 5:30 pm. on Thursday, August 24, 2017. See official notice. Bring your entire family to the first-ever Pony Homecoming Carnival, which will take place from 4-6:30 p.m. on Friday, Sept. 15 on the high school campus. This free, family-friendly event will feature games, activities, stage performances, food trucks and concessions. Learn more at stillwaterschools.org/homecoming2017. 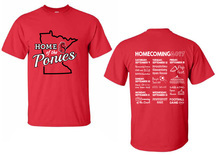 Buy your official Homecoming 2017 t-shirt at ponypride.org. Child through adult sizes are available. Proceeds will go to the high school to support next year's homecoming festivities.